Phuket, Koh Yao Yai, Krabi, Koh Puh, Koh Phi Phi Don, Ko Rancha Yai, Patong, and more! 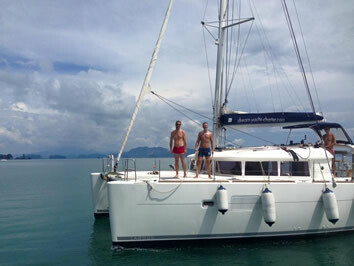 This is an Adonis Exclusive Gay Sailing Cruise on two luxury new 40 feet Lagoon Catamarans. This cruise includes breakfast, lunch, harbor fees, taxes, endcleaning and gasoline and the service of a Gay skipper and Gay co-skipper/Cook. Start and finish in Phuket. Both weeks have a different itinerary. We sail this cruise together with two catamaran yachts, so all together 20 gay guys! All cabins are for two persons, some with double bed, some with split double bed, two singles can sleep here as well (see layout). You can also book a 1-person crew cabin, these are the small cabins in the front, only accessible from the deck. The cruising grounds off the east coast of the island of Phuket are among the finest anywhere. Towering pinnacles of limestone jut from the emerald-colored and sheltered waters of Phang-nga Bay. 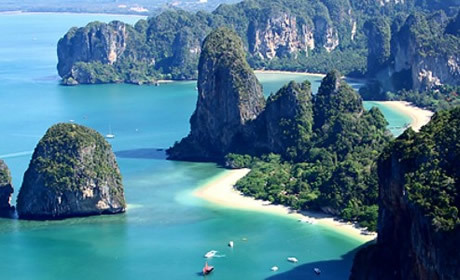 To the south, the famous Phi Phi Islands stand as jewels of the Andaman Sea. More than 130 picturesque isles lie within the province of Krabi alone, and the offshore marine preserves of the Similan and Surin islands are internationally famous as one of the world's top scuba diving sites. A Phuket sailing vacation offers a multitude of scenic and secure anchorages, pristine white-sand beaches, rugged uninhabited islands, and lively gay nightlife and gay resorts.The warm, hospitable people of Thailand enhance the enjoyment of an Adonis Gay sailing cruise, making the sailing adventure all the more memorable in a nation often called the Land of Smiles. With this sailing cruise it's easy to make a combination with a stay in Phuket, Bangkok, Pattaya or Ko Samui. On X-Mas Eve December 24 we will have our X-mas dinner, at the SALA Phuket Resort & Spa, close to the Marina. as a start of our Sailing Cruise. We will spent New Years Eve in Patong, for a great gay party! Boarding in Phuket after 4 pm. The skipper will welcome you with a welcome drink and show you your cabin. Dinner in the restaurant of the marina. Koh Yao Yai 20 nm. The first day of our cruise through the tropical paradise of Phang-nga Bay takes you westward toward Krabi Province. At the south end of Koh Yao Yai we have an excellent anchorages for all seasons and we will have dinner in the restaurant of the nice resort on the beach. 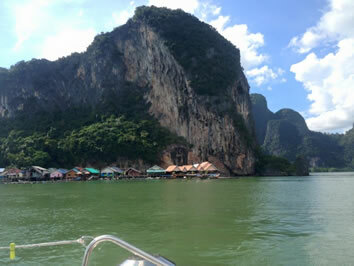 Railay Beach – 20 nm. The next stop on our Phuket itinerary is just a sail to the mainland, with its gorgeous beaches and secluded bays. Krabi is world-famous for its beauty, and Rai Le Beach is a prime example of what makes this part of Thailand so popular. Catering to more laid-back guys, Railay Beach offers excellent snorkeling on the coral reef and swimming off a pristine white-sand beach lined with coconut palms. Pleasant beachfront restaurants serve simple fare, and you can relax with a cool drink in the shade and admire the sparkling waters of the Andaman Sea. Koh Phi Phi Don – 20 nm. Sailing nearly due east takes us to the Phi Phi Islands, one of the most beautiful archipelagos in Thailand. Phi Phi Don is the largest island in the group and has the best anchorage and facilities at Ton Sai Bay, where we'll find restaurants and bars with lively nightlife. Ko Rancha Yai. After the partycrowd on Koh Phi Phi Island, today we sail to a smal Island south of Phuket Island to relax and recover :). Patong. Today we sail along the west coast to the popular town Patong. At night we will visit the local gay life. Day of for the guys who stay two weeks. Have a look at Patong Gay beach and Patong town or book an excursion on Phuket Island. For the other guys, this is the time to hop on or -off the yacht for the one week cruise. At night the last change to visit the local gay life. This itinerary is subject to change. Local circumstances such as weather may influence the itinerary..
You fly to Phuket International Aiport, maybe with a stopover. From the airport it a short taxi ride to the marina. Take a meter taxi! About 10 min, 10 euro. The second we boarding (or disembark) is in Patong, more south of Phuket Peninsula. Also take a meter (!) taxi from the airport (45 min, about 25 euro). Cruise Only, Per Person, Double Occupancy. This cruise is including accommodation on board, the service of a gay skipper and gay cook, breakfast, lunch, soft drinks, harbor fees, tourist taxes, gasoline and cleaning. Not included dinner (on the shore in local restaurants) and alcoholic drinks.